Apricot Orange Bars from Julie Hasson is a recipe adapted from an old issue of Bon Appetit. On a scale of 1-10, these bars are a 15. I’ve pasted the recipe below, but you can see the original recipe plus reviews on Epicurious. Update: Don’t be put off my this old photo! The bars are really much prettier, and I need to make them again and do a re-take. Preheat oven to 325 degrees. F (165 C) Line a 9x9 inch pan with parchment. If making half batch, use a 9x5 inch loaf pan. Combine preserves and orange juice; Set aside. In a small mixing bowl, crumble up almond paste and set that aside as well. In a large mixing bowl, beat together butter, sugar and almond extract. By hand, stir in flour and salt. Scoop out 1 cup of the flour mixture and add to the bowl with almond paste. Mix this together to form topping. Add the sliced almonds. Press remaining flour mixture into bottom of lined pan. Spread apricot/orange mixture over top. Crumble flour/almond paste/almond mixture over filling. Had to come check out your photo after reading your comment. That’s not such a bad photo! I love these bars. Truly at the top of my favorites list. I made the Apricot-Orange shortbread bars for a cookie exchange this past weekend. I have received numerous requests for the recipe now because everyone loved them so much. Thanks for posting the recipe. I made the apricot-orange shortbread bars again. And I know I said they weren’t “wow” for me, but evidiently, someone else really liked them. I took them to an office dessert contest today and they won 2nd place. The prize is a half a vacation day! Which I can really use right now. (I’m 8 months pregnant and I’m looking forward to half a day of doing nothing but resting.) Thank you for sharing this recipe! I’m glad your mom liked them. I generally not an apricot person OR a shortbread person, but compared to other fruit bars, these are stellar….or at least I thought so ;). I made the apricot-orange shortbread bars yesterday. Very easy. I have decided I am not a big, huge shortbread cookie person. I thought they were good but they were not “wow.” My mother tried them and absolutely loved them. These cookies are now on her top-ten list, she liked them that much. I ran into the recipe for Apricot-Orange Shortbread cookies and they sound outstanding, so will try them while I await help with my original quest. Thank you especailly for the Apricot-Orange Shortbread Bars recipe. It will be a family favorite. I discovered it in my search for a former fourt grade student who moved from Monroe, Michigan to Utah somewhere around 1995. His mother made an amazing chocolate cherry cookie for our class to celebrate his birthday. When I commented that the cookie must be a family favorite she replied that she had just found the recipe that day. It was our good fortune that she did because this recipe has wowed our family and friends on many occassions. We call it the LANCE BINGHAM birthday cookie. If anyone knows the real Lance Bingham let him know that he is very happily remembered in MOnroe, MIchigan. Hi Anonymous,I’m glad you liked them. And you are right. They’re definitely more sophisticated.I haven’t tried them with the orange liquor yet. One day I’ll get around to it. I made the apricot-orange bars at Christmas time using the original receipt found in the magazine. It called for Cointreau in place of the orange juice used in your adaptation. Everyone who tried them loved them. I ended up making a batch to take to a work party and they were a big hit there as well. It’s a very easy cookie to make, yet very sophisticated. I’ve given out the receipt to several people..
OK, I cut out that recipe for the chewy chocolate cherry recipe, bought the ingredients, and now I can’t find the recipe! When I click on the link, it takes me to a subscription page. Any way to get another copy of the recipe? Anna, Anna, Anna! I’m going to have to stop reading Cookie Madness! 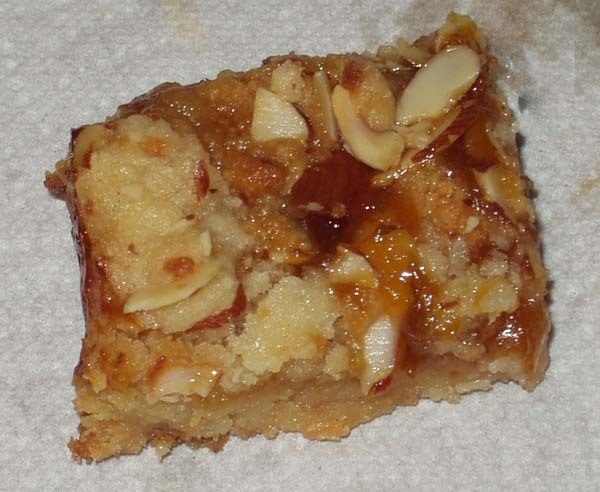 But I might have to make the Pecan Sables first :)I made the Apricot-Orange Bars. They are decadent! Very rich and buttery. What do I do with the rest of the almond paste, any ideas? Nic, I hope you try them. And Val, I posted a post about raspberry. S’Kat, my ear is feeling a bit better today. I guess I won’t have to cut it off. oh, another question…did you really bake them for a full hour?? Those shortbread bars? They sound too delicious! Great choice, Anna. I haven’t heard of her, but I do just happen to have a jar of apricot-habanero jam that was eyeing me dolefuly from the refrigerator earlier today. Hmm…. Sorry to hear that you are still having problems with your ear! If only baking therapy could truly take care of it. these really do sound fabulous. I am not the biggest apricot fan, so I was thinking of trying them with raspberry jam. unless you would really recommend at least trying with the apricot the first time.thanks for the recipe. oh, and I agree about Julie’s recipes. I have one of her cookbooks and have made about a dozen winners (and no losers) from it. Ali, they really are incredible. The almond paste in the topping makes them stand out.